By Marilyn A. Fitzgerald, Ph.D.
It’s not often that I’m able to review a book written by a local Northern Michigan author. 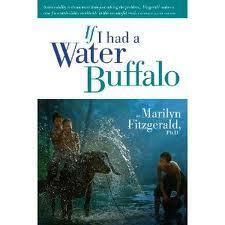 Therefore, I looked forward to reading “If I had a Water Buffalo” by Marilyn Fitzgerald of Traverse City. Fitzgerald has traveled extensively throughout the world and provides consulting and publication services through her company, Common Ground Solutions. The book’s subtitle: “Microfinance as a Means to Sustainability”, suggests that it should focus on the process of lending money to individuals or smaller businesses. In reality the “If I had a Water Buffalo” is more broadly based, addressing the essentials of humanitarian aid that the author has learned through her years of education and experience. It’s eye opening to hear Fitzgerald tell of the well intentioned service clubs and private donors that are often mismatched with the actual needs of the community and people that they are intended to serve. The book’s title, “If I had a Water Buffalo” refers to Fitzgerald’s work in a rural village in Indonesia. Fitzgerald was on her fourth trip to this severely poor area, working with money obtained back home in the U.S. to fund children for school. The program in this village had been relatively successful yet there were still unmet challenges including some children that desired an education. Simply collecting more money from donors in the U.S. was becoming problematic. It was about this time that Fitzgerald was given a suggestion by a man in the village named Nyoman that would change her entire approach to fundraising. Nyoman wanted…a water buffalo. Nyoman insisted that if he had the $250 to purchase a water buffalo that he would be able to harvest the nearby rice fields three times a year (rather than one), thus tripling the capacity of the rice field and Nyoman’s income. That additional income could then be used to send Nyoman’s own children to school rather than relying on donations from Fitzgerald’s donors and others. This breakthrough was a game changer for Fitzgerald who learned that the water buffalo example was a metaphor of sorts for understanding the local landscape before blindly solving the problem and making a small initial investment that can pay off many times over. The book is divided into three sections that lay out the essentials to: “Learn how sustainability, relationship building, integrative negotiation, and project management are keys to stopping the endless cycle of fundraising and instead have a long-lasting, positive impact”. Fitzgerald focuses much of “If I Had a Water Buffalo” on building models for giving that will attain lasting outcomes, which in the beginning is not part of the plan for many novice humanitarian aid efforts. This process includes serious negotiation, relationship building, and many times conflict that take considerable time and effort. By writing “If I had a Water Buffalo”, Fitzgerald is able to combine her well vetted approach for fine tuning humanitarian aid campaigns with great stories that fit together in book that is well worth reading. At times the book is somewhat heavy in theory but that should not be a major deterrent for anyone. I have gotten to know Fitzgerald over the years; therefore I’m not rating this book. We actually worked on a local effort to bring more financial resources to local small businesses that was initially not successful, but like the book itself, that experience was part of the winding road that needed to be traveled before a successful result was eventually reached.